I’ve done quite a few school visits in recent weeks – but one in particular had special significance for me. 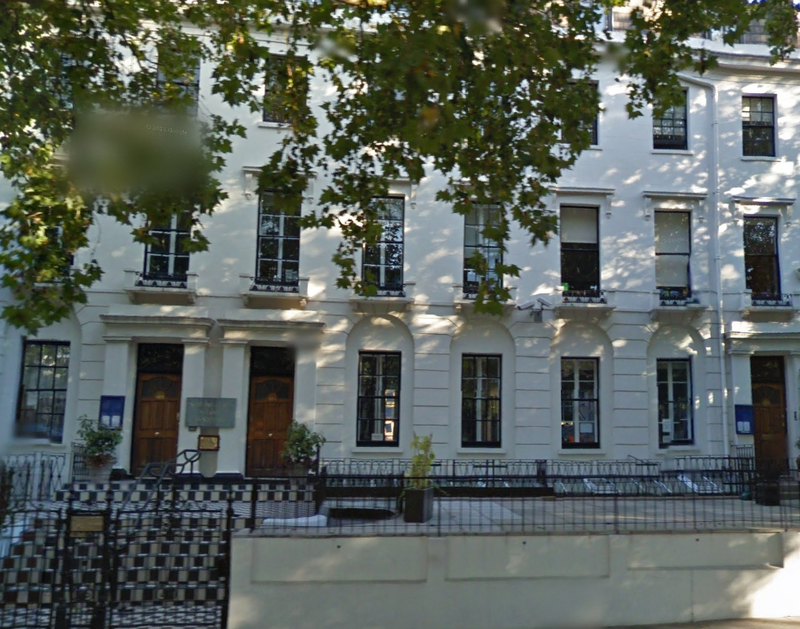 This was a day spent at Norland Place School in Notting Hill – the area in London that first inspired the story of my time travel adventure, The Secret Lake. Those of you who follow my blog will know that the story was turned down by publishers for being too ‘traditional’. 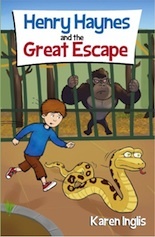 Thank goodness I didn’t give up on it – it’s now sold around 6,000 copies between print and Kindle (circa 80% in the UK and 20% in the USA) and continues to be a firm favourite at both school events and Waterstones signings. Given the book’s lasting appeal – and finally having taken it back to its roots, I thought it deserved to have its own story told. I also hope post this will offer inspiration to anyone having doubts about a story they truly believe in. 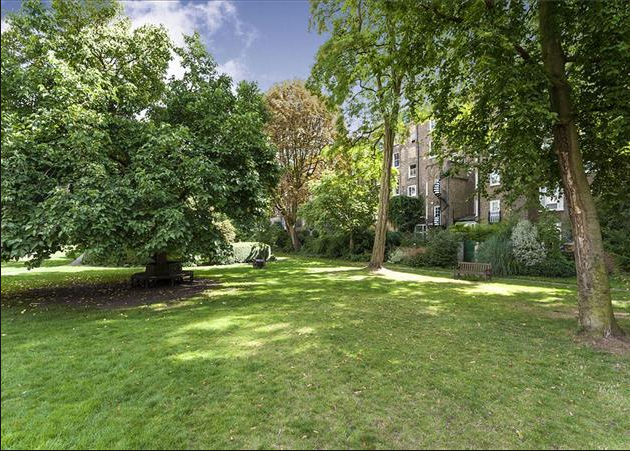 Most of the Notting Hill communal garden houses have now been converted into apartments. 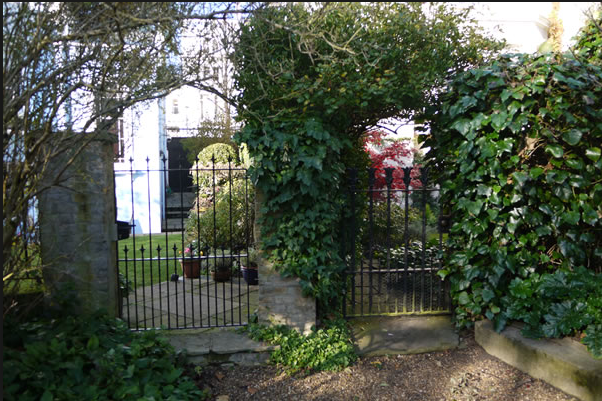 Those on the ground floor have direct access to the gardens from their own patio gardens – other residents have a key for access via a separate gate. The Secret Lake came about after some friends moved to one of these Notting Hill apartments many years ago when our children were around age five and seven. The moment we walked out into the gardens I was struck by their magical atmosphere. The sound of twigs cracking underfoot echoed all around as children raced across the woodland lawns playing chase, or hide and seek, while others (often younger) huddled inside bushes, making secret dens. Exploring the gardens and seeing these children lost in their imaginary worlds brought back memories of my own childhood and the freedom I had growing up in the Hertfordshire countryside. In those days we’d often go off for hours at a time into the woods to play, without so much as a ‘goodbye’ to our parents! The communal gardens offer plenty of places to explore and hide! As I watched the children playing and surveyed the grand houses all around I found myself wondering – wouldn’t it be wonderful if the children from today could meet the boys and girls who had lived in their homes and played in these same gardens 100 years earlier? I didn’t realise it at the time, but the idea for The Secret Lake had just been born. I wrote the three lines below as I slowly started to formulate the story – and they now sit before the opening chapter. Come and play in the garden of imagination. In distant lands, or time forgotten. When I later came to write the story, the layout of my friends’ apartment, which spanned the lower ground and ground floors of the original house, provided the backdrop for the scene in which Tom and Stella break into their own home at night in past time to get food. My friends’ children – Jessica and Tom – provided much of the inspiration for the main characters in the story, Stella and Tom. The real Tom in particular had boundless energy and was always getting into trouble (of the typical boyish type), while his quieter and older sister, Jessica, was both protective of and exasperated by him! Oh, and she had blonde wavy hair similar in style to Stella’s, seen on the front cover of the book. It was an adventure in itself checking and recreating how the rooms in their modern-day apartment had been used and furnished back in late Edwardian times – and highly amusing trying to imagine Tom’s reaction when he walks into what he thinks is going to be ‘his’ bedroom, only to find a grand dining room with the Gladstone family portraits staring down at him! But Tom, with his tummy satisfied, had other ideas. ‘I’m not going until I see my room!’ he murmured solemnly. ‘I don’t care!’ he muttered through clenched teeth. Jack led the way through a door that Tom and Stella didn’t recognise from their own home, but soon they found themselves climbing a familiar staircase towards the front door. The walls of the main hallway were adorned with large heavily framed paintings whose subject matter Stella couldn’t make out. Jack was now heading for another set of stairs she didn’t recognise. Stella darted forward and tugged at his sleeve, then pointed at the door beside her. ‘This ain’t a bedroom!’ he whispered. Stella nodded vigorously then pointed at Tom. Jack gave a puzzled frown. The door was ajar and creaked so loudly when they pushed it open that they all froze. Nothing stirred, except the hollow tick of a clock somewhere in the hallway above. Quietly they stepped inside and Stella switched on her torch. As the beam lit up the room, Tom’s mouth fell open. 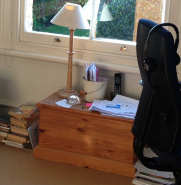 His bedroom was in fact a dining room – and one fit for kings and queens at that! In the centre of the room, which spanned the width of both his and Stella’s bedrooms, was a vast mahogany dining table complete with three sets of silver candelabras, spaced evenly in a line down the middle. The table was surrounded by about twenty crimson velvet high backed chairs, and above it hung an enormous chandelier which shimmered silently in the moonlight filtering in through the shutters. A vast and elaborate gilt-framed mirror hung over what was, of course, his fireplace, which stood at one end of the table. Either side of the fireplace, and on all the other walls, huge portraits of the Gladstone family looked down on them. The Edwardian characters in the book – Sophie, Emma, Jack and Lucy – just popped up as the story unfolded. (I didn’t plot the book in advance – though in hindsight it would have helped me finish it sooner had I done so!) I remember being especially startled when Lucy appeared in the garden from nowhere soon after the break-in. But there she was, hands on hips, demanding to join the adventure. I had no choice but to let her in! My friends had also told me about a grumpy gardener – and he made his way into the story in the form of the snarling Charlie Green. The garden had been quiet for a good half an hour. Finally the children got up and crossed to the line of trees that looked towards the houses. The moon had faded leaving the lawn dull and lifeless. The trees and bushes now stood wrapped in the grey cloak of dawn and as the children peered across, they could see that the house was in darkness, apart from the faintest glimmer of light from a small window high up. Slowly they crept across the lawn and into the courtyard. ‘I bet that’s Emma’s window up there!’ whispered Stella. ‘Maybe she’s waiting for us. Maybe it’s a sign!’ whispered Tom. ‘I hope she hasn’t fallen asleep!’ murmured Stella, twirling the bracelet on her wrist. Tom and Stella swung round in terror to find a young girl standing triumphantly behind them with her hands on her hips and her feet wide apart. She was wearing a long dark coat over ankle length boots. Back to Norland Place! At school visits – and Norland Place was no exception – children often ask me which of my stories was my favourite to write. I always tell them that while I love all of my books, The Secret Lake is closest to my heart. This isn’t just because it was the first book I wrote. It’s also because it echoes the freedom and adventure I experienced in my own childhood – and which I enjoyed in books that I read as a child, such as The Lion the Witch and the Wardrobe, Alice in Wonderland and The Secret Garden. We all need escape and adventure when growing up. This isn’t always easy – especially if you live in the city – but if it can’t be had in the real world then at the very least it can be had in the imaginary worlds of books. The feedback I get from children at school readings and signing events, and through their reviews, leaves me in no doubt that modern children still love a traditional adventure story just as we grown-ups did at their age. This really heartens me – especially since at one stage The Secret Lake sat in a box for over 10 years after being turned down by several publishers for being too traditional! The Secret Lake sat in this box (& on my hard drive) for 10 years! As I write – and as I said earlier –around 6,000 children have enjoyed The Secret Lake – around 3,500 on Kindle and the rest in print. The Amazon and Goodreads reviews speak for themselves – both in number and quality. And I’ve never offered the Kindle book for free (I can’t bear the idea of it languishing unread on someone’s e-reader!) so can be pretty sure it’s actually been read by close to the sales number. You can buy The Secret Lake in print at any online bookstore or from the Kindle store. You can also order it in print from any bricks and mortar bookshop. It’s also stocked in selected branches of Waterstones and in The Notting Hill Bookshop The Barnes Bookshop and The Sheen Bookshop in southwest London. I have a feeling that the best stories really won’t let you leave them alone – because they just know that they need to be read. So if you have a special story inside of you that you truly believe in, my advice is don’t ever give up on it! I probably shouldn’t leave without a brief note on the lake in The Secret Lake – after all there is no lake in Notting Hill! A few weeks after our visit to our friends we were in Isabella Plantation in London’s Richmond Park. 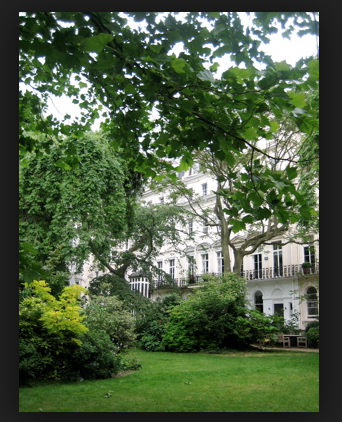 We’d been several times before with our sons as it offers a safe and magical place for children to run around in and let off steam, much in the same way as offered by the Notting Hill communal gardens. On that occasion we happened to run into a neighbour who pointed us in the direction of ‘The Secret Pond’ (this was her nickname for ‘Still Pond’ – seen in the photo above). We’d somehow missed this on our previous visits – there are two other ponds in Isabella Plantation. So we followed her directions, and the moment we came across it, I knew that the book’s front cover and title were settled – and that I just had to write the story! 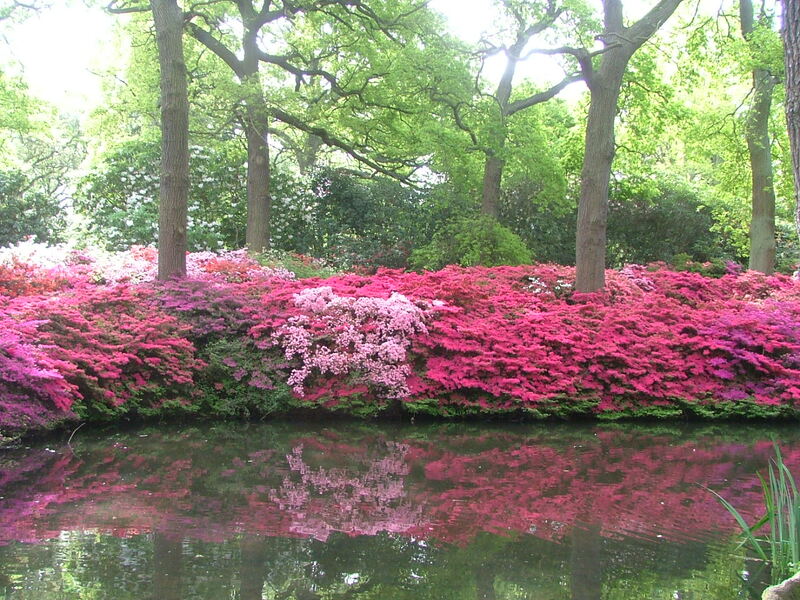 Isabella Plantation will be in full bloom as I write – if you live in southwest London and haven’t been, don’t miss it! If you search for it on Google you’ll find some incredible images. With thanks to Norland Place School! My thanks to Norland Place School for inviting me in for the day – and for possibly the best school lunch I’ve ever had! 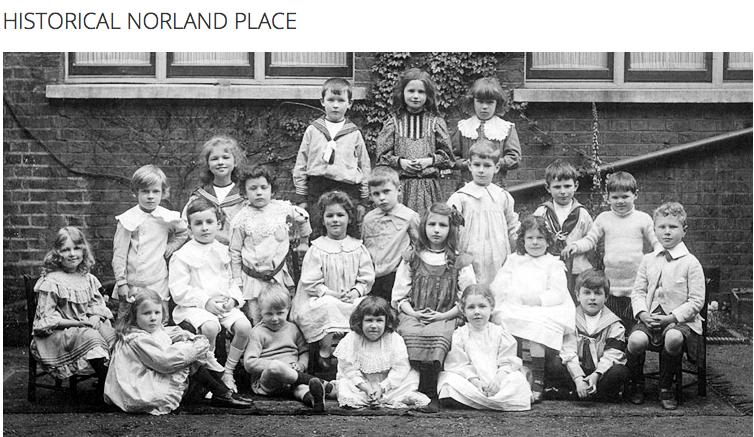 The children were a delight – and Reception through to Year 6 enjoyed readings from all of four of my books and went home with signed copies at the end of the day 🙂 I leave you with a photo from the school’s website, which shows young children who attended the school around the time my cast of characters would have been playing in the communal gardens! 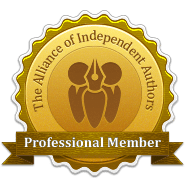 This entry was posted in Children's Books, Self-publishing and tagged adventure stories, kidlit, Norland Place School, Notting Hill, self publishing, The Secret Lake, time travel. Bookmark the permalink. Thanks Karen for such an interesting article. Your cousin Bernice in Canada. Thanks, Debbie – interestingly I was talking to the owner of our local bookshop yesterday and she said she once judged on one of the national competitions and both she and Julia Eccleshare wanted a traditional story to win, but they were outnumbered by the rest of the panel of editors etc. I was glad to see at London Book Fair that there are plans to involve more children in selecting prize winners! And it seems that surveys show that children choose very different books from adults generally. That’s very interesting feedback, Karen. I am always intrigued to see which books my daughter (11) chooses – seldom what I’d have chosen for her, and she often resists what I recommend, even when they were books I loved as a child, and we’re very similar in personality in lots of ways.